Uber is a four-year-old mobile ride service company that could soon generate $US10 billion of revenue per year. How much revenue is Uber currently generating? How many active users does it have, and how many people are driving for it in cities around the world? Business Insider obtained an internal Uber memo that’s nearly 60 pages long that was produced in early 2014. In it, there’s city-by-city data in terms of revenue, active drivers, average fares, active users, trips per week, and more. Most of the data only spans one month — December 2013. Even though the numbers are dated, there’s a lot to learn from it. For example, San Francisco generated nearly $US18 million of revenue that month. A year of that monthly revenue would make San Francisco alone a $US212 million business annually for Uber. And that’s just one market. That calculation also assumes no growth, and Uber has expanded to nearly 100 more cities since then. Uber generates a significant portion of its revenue from its most mature markets. 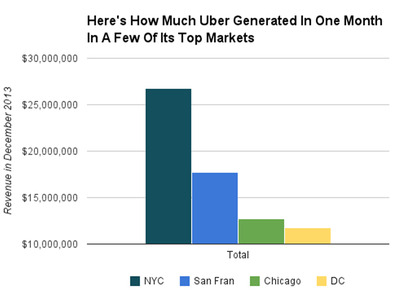 In December 2013, Uber generated about $US11.7 million in Washington D.C. (a ~$US141 million annual run rate). It generated $US26 million in NYC, or an annual run rate of $US312 million. In Chicago, Uber generated $US12.7 million for a run rate of $US152 million. In San Francisco, Uber generated $US17.7 million, a run rate of about $US213 million. Los Angeles generated somewhere between NYC and San Francisco’s revenue. If you assume annual run rate based on the December 2013 data, Uber’s top five markets (NYC, DC, San Francisco, Chicago and Los Angeles) would generate about $US1 billion a year. Again, that’s without taking Uber’s growth and expansion into account during 2014. That’s in line with rumoured revenue estimates for Uber, which suggest Uber will generate $US1.5-2 billion of revenue this year. Uber’s biggest revenue day last year may have been on December 31, when it generated nearly $US11 million across 60 markets. Its top markets, NYC, San Francisco, Los Angeles and Chicago all generated more than $US1 million that day, and DC generated almost that much — $US918,918). The median Uber city that day, however, generated a mere $US22,226. 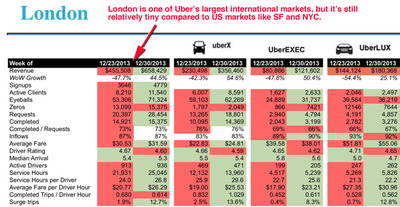 This shows just how much room for growth Uber has ahead of it. As of last December, Uber was doing more than 100,000 trips per week in each of its largest cities. It had hundreds of thousands of active users in those markets. For example, San Francisco had about 70,000 active users per week in December 2013 with just a few thousand active drivers. Business Insider sifted through and organised the data into a number of charts and graphs to make it easier to scan. We also included the city-by-city breakdowns directly from the Uber presentation so you can see how the charts were derived. 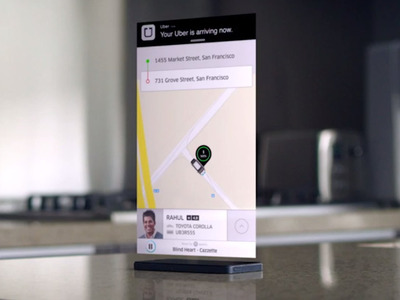 Here’s the most in-depth look at Uber’s operations yet. Uber declined to comment for this story. 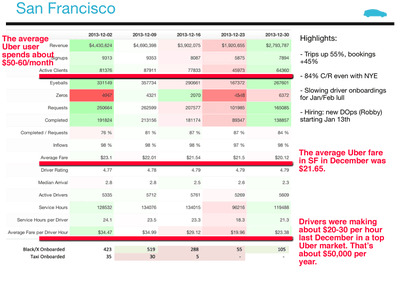 The Uber presentation mostly shows December 2013 data, which BI compiled into a bunch of charts. So here's what monthly revenue looked like in Uber's top markets, almost one year ago. There's a dip the week of Christmas, and a surge during New Years Eve, Uber's biggest night of the year. 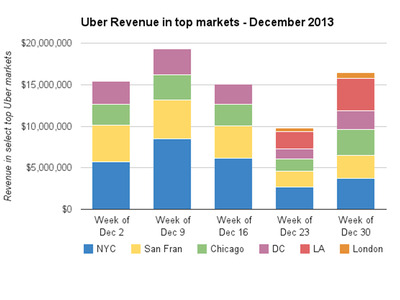 Here's how much Uber generated in December 2013 in four of its top markets. Where's that revenue coming from? 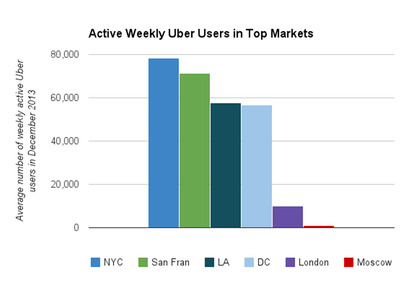 Well, there are tens of thousands of Uber rides completed in Uber's top markets every week. And new users are signing up all the time. Some of them are incentivized with promotions, which can total more than $300,000 in Uber giveaways per market per month. Burn, baby, burn. 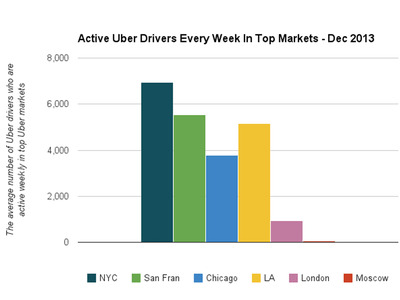 Last December, here's how many Uber drivers were active on average every week in top markets. 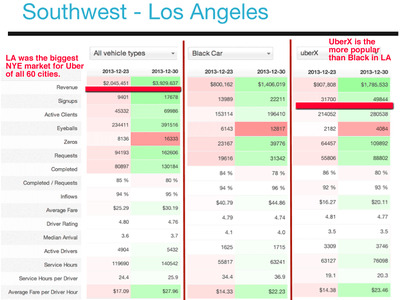 Uber closely tracks what percentage of all rides in each market have surge pricing. 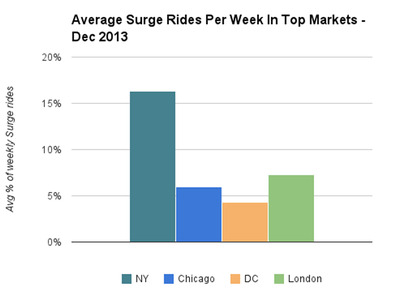 Here's the average per cent of weekly surge rides in top markets last December. 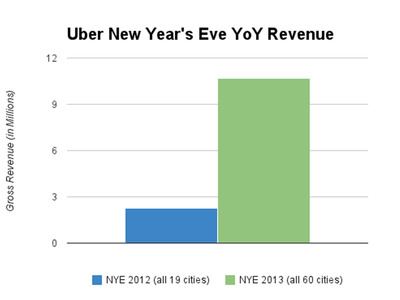 The biggest night of Uber's year is always New Year's Eve. Revenue skyrocketed that night from a few million in 2012 to nearly $11 million in 2013. 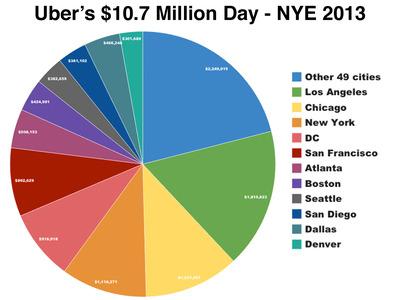 Here's Uber's $10.7 million day, broken down by market. 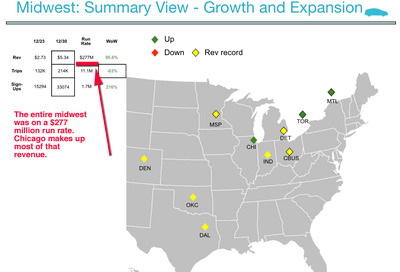 Here's some more detailed city-by-city data from the leaked presentation Business Insider reviewed. Here's San Francisco's data for the month of December 2013. It generated about $17.7 million then, which is an annual revenue run rate of about $213 million. LA is a massive market for Uber. 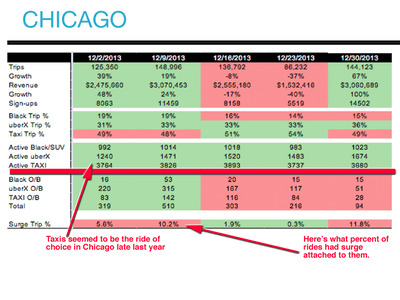 Here's some detailed data from last December, broken out by Uber Black and Uber X.
Uber also crushes it in Chicago. Here are some deep metrics on Chicago's number of completed rides, surge pricing, active drivers and active users from last December. It generated about $12.7 million, or an annual revenue run rate of $152 million. The midwest alone was generating a $277 million annual revenue run rate for Uber last December. NYC is also a major Uber market. It generated more than $26 million last December. That's a $312 million annual run rate in NYC alone. But notice the net revenue and ~ $318,000 marketing burn. 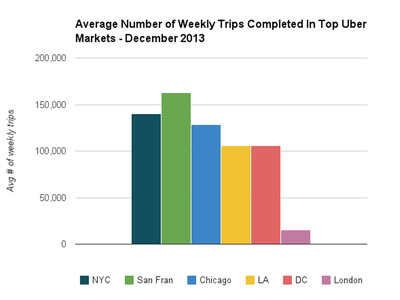 This chart seems to show how many Uber trips occurred in November 2013 and December 2013 by area. New Jersey nearly doubled. 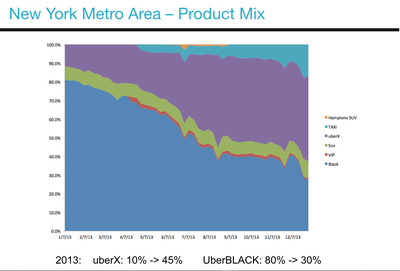 UberX ate into NYC's Uber Black market a ton during 2013. 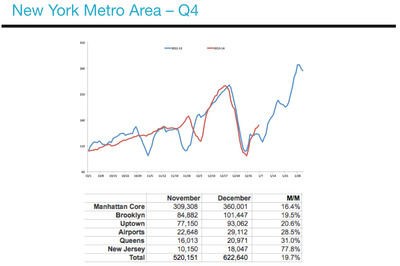 Here's how quickly UberX has grown in NYC. Despite intense regulatory battles, Uber is popular in the Washington DC area. It generated about $11.7 million in DC last December, which is an annual revenue run rate of about $141 million. Again, there was a ~ $316,000 marketing burn. How's Uber doing outside the US? London, which has been dominated by Hailo, is slowly turning in Uber's favour. Here's the progress Uber made there late last year. 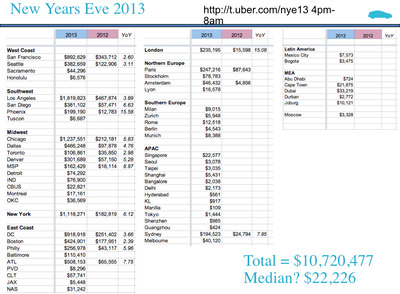 Finally, here's a city-by-city breakdown of Uber's biggest day of the year, New Year's Eve 2013. 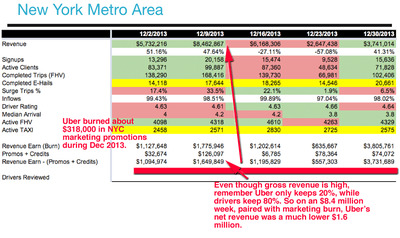 This shows just how much Uber relies on its established markets for revenue generation. While it generated nearly $11 million that day, the median city generated a mere $22,226.